THE 5 MANNERS OF DEATH. After a construction worker unearths a human skull on the campus of the University of Mississippi dating to the 1960s, an older woman’s desperate attempt to erase history counts down the five ways to die in the thriller, “The Five Manners of Death.” The woman is the niece of Dr. Diana Bratton, a surgeon surrounded by bodies after the discovery of her Aunt Phoebe’s 50-year-old note detailing the manners of death. Suicide, accident, natural causes, and one death classified undetermined are soon crossed off this list—leaving Diana to believe that only homicide remains. Yet the police prove her wrong. Diana believes that family trumps the truth but discovers that murder is her family secret. “The 5 Manners of Death” is available in hardcover and softcover print, eBook, and audiobook. Darden North’s mystery and thriller novels have been awarded nationally, most notably an IPPY in Southern Fiction for “Points of Origin.” His newest novel is “The 5 Manners of Death,” which also followed “Wiggle Room,” “Fresh Frozen,” and “House Call.” North has presented and served on author panels at writing conferences including the Natchez Literary and Cinema Celebration, Killer Nashville, Murder on the Menu, Southern Independent Book Association, and Murder in the Magic City. 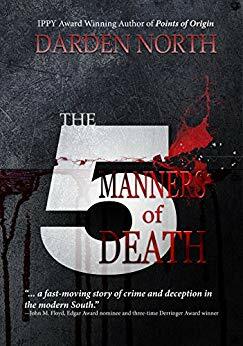 Interested in a free download of the audiobook “The 5 Manners of Death" in exchange for a review posted on audible.com and/or Amazon? Contact author Darden North at darden@dardennorth.com for a free promo download code.